How Garfield Sobers beat cricket’s ultimate record. Extract 5. In the 18th century Swansea was a thriving port. Ships plied to Australia, South America and as far as San Francisco. The Balclutha, one of those vessels, sits, preserved, in San Francisco harbour. In the 1800s, while the eastern part of the then town of Swansea had to endure the appalling effluent from the copper industry in the Lower Swansea Valley, one of the most polluted industrial areas in the world, the shore of Swansea Bay, two miles away and spared by the prevailing west wind, developed into a desirable residential area. (Swansea Museum records this: “The devastation caused to the Lower Swansea Valley by the density of industry it housed between the early eighteenth and early twentieth centuries left behind the largest area of industrial dereliction in Europe.” The blighted land was cleaned, cleared and reclaimed in the Lower Swansea Valley Project, which began in the early 1960s. The original St.Helen’s convent land was sold, and area adjacent to the Oystermouth Road was being eyed as prime land for building. Exceedingly smart homes on this, the right side of town, had been built nearby. The sports lobby had to move fast to preserve the coast for recreational. The sandbanks lining the foreshore were levelled, turfed and rolled, and during the summer of 1873 Swansea Cricket Club played their first games at their new home. 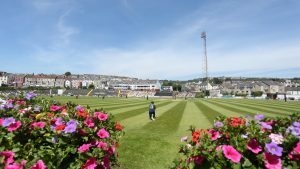 St.Helen’s, now one of the best equipped grounds in South Wales, staged a three day game against a United South of England XI in 1876, followed in 1878 with a game against the Australian tourists. In 1890 the recently formed Glamorgan County Cricket Club played the MCC there. I doubt if the visitors were told too much about the ground’s construction. In places the soil is barely eighteen inches thick. This was to make it a challenging place to play cricket for 100 years or more. The ground was improved over the years, with a new stand and the magnificent pavilion and terraced members’ enclosure at the north end. Many of the great players have been seen clumping down the 67 concrete steps from the pavilion to the field. Huge crowds would gather for tourist games, often staged over the August Bank Holiday weekend. 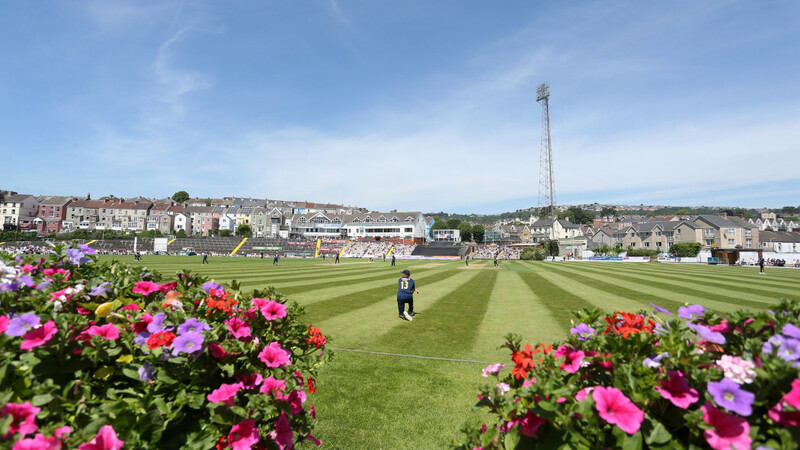 Contests where overseas touring sides played against Glamorgan were considered unofficial Test matches against Wales. In 1948, 50,000 people pressed into the ground for the game with Don Bradman’s Australians. The ground was packed again in August 1951 when Glamorgan beat the South Africans by 64 runs. Jim McConnon took 6-27 as the visitors collapsed from 54-0 to 83 all out. In 1964 Glamorgan defeated the Australians by 36 runs, thanks to magnificent spin bowling from Don Shepherd and Jim Pressdee. Glamorgan repeated the feat in 1968, three weeks before Sobers’s innings, with Don Shepherd leading the side. The incoming tide was said to favour the bowlers. Glamorgan captains of the past such as Wilf Wooller and Maurice Turnbull would consult the tide tables for Swansea Bay before going out to take the toss. But on that one day in August 1968, a batsman was never more in control.